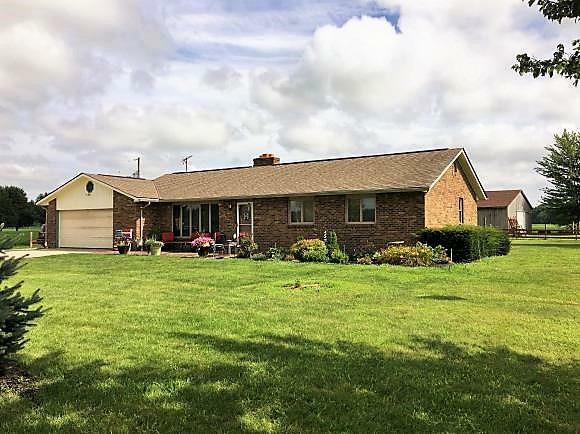 Sunman Exit off I-74 North to R on Rosefeld Rd, R at the stop sign to R on N County Line, property on R.
Looking for that Country setting close to the Interstate? All Brick Ranch w/partially finished w/o basement, 3 BR/2 full BA, wood flooring, double sided wood FP, updated mudroom & Country kitchen. 36x36 Wood Barn, garden & super yard. 14 acres tillable, 29 acres classified forest. Addtl 53 Acres adj. land available. Natural Gas & Septic & Cistern.